Ruby Parolee Stines always said she was born in Marshall, Madison County, North Carolina. (DOB: September 25, 1922) Her parents are John Roy Stines also of Marshall and her mother, Belva Cooper of Magoffin County, Kentucky. Ruby was the second born of her three brothers, James Berry (1920 - 2004), Paul Vencil (1924 - 1987) and Daniel L (1926 - 1977). There are no orignal birth records on John & Belva's children, but there are delayed birth certificates on the three boys. Ruby obtained a second copy to help prove her birth. This is the only document that proves the birth date of Ruby P. Stines Colegrove. My mother and I went North Carolina & Kentucky Vital Records Office to try and find a birth certificate. Our trips were unsuccessful. Ruby quickly realized what growing up was all about. Losing her mother when she was only 8 and losing her father when she was 14, Ruby and her brothers were taken in by their Uncle Fessie, John Stines' youngest brother. This period of Ruby's life wasn't the best. When she didn't (or couldn't) live with her Uncle Fessie, Ruby had to live with different relatives or friends of the family who had small children and needed the help of a woman (or girl at that point). Ruby told her children that she would do whatever was needed around the house. House cleaning, cooking or taking care of people's children. Time passed and Ruby was able to go out and start her own family. She met a tall and handsome man, Curtis Christopher Colegrove (1916 - 1977). He was six years, five months and 22 days older than Ruby. Ruby and Curtis (they were also called Polly & Curt) decided to marry and did so on August 27, 1938. Just two short years after her father's death. Unsure where or how they met, they decided to live in Floyd County, Kentucky. Some of Curt's family is from Floyd County and some lived there the same time Ruby & Curt did. 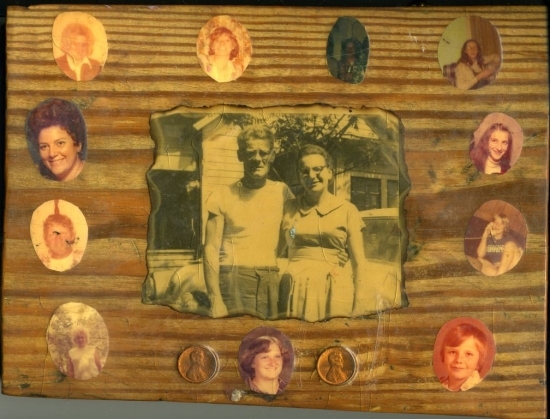 Together, Curt & Ruby had eleven children, eight girls and three boys. On May 11, 1939 (8 months and 14 days after they married) Ruby gave birth to their very first child. Belva Sue. Ruby was about four months away from turning 17-years-old when Belva was born. Johnny Roy was born on January 19, 1941, just a few years before their sister Sarah Louise (January 9, 1945). The birth records for Ruby & Curt's first three children indidcate they lived in Floyd County, KY. 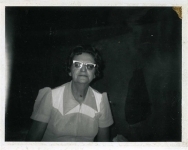 Sometime after 1945, after the birth of their third child, the family moved to Harlan County. This move was probably based on Curt needing to find work. Patricia Ella, born February 27, 1947 was their fourth child. June 18, 1949 was the day Helen Belinda joined the family, about four years before their next son. Curtis Christopher (no record of being a Jr.) was born February 12, 1953. Just a little over a year later (August 4, 1954) Ruby and Curt brought yet another girl into the world. Cathy Jean. Cindy Jane was born February 28, 1956, and she was the third sibling born in the month of February. May 11th must have been a special day for Ruby and Curt, their ninth child, Tina Marie was born May 11, 1960. Tina was born the same day (May 11th) only twenty-one years later than Ruby & Curt's first child, Belva. Their tenth child born was Rebecca Faye. She was born on March 17, 1962. She was a St. Patrick's Day baby. The youngest of the family, James William, was born on April 12, 1965. And then- they didn't have any more children. Ruby and Curtis Colegrove raised eleven children and spaced them out over 26 years. Ruby was only 16 years-old when she gave birth to her first child and she was 42 years-old when she gave birth to her last child. It was obvious that working hard was not something she was afraid of, this was a task she had done all of her life. For Curt's job always had him away from home, Ruby worked several jobs and help made ends meet. It was very common that Ruby would take on the ironing and sometimes the wash for the wealthier ladies who lived in Harlan. She was the first in the house to wake up and the last to lay her head down at night. I am sure there were countless nights when she didn't sleep at all. Living in a coal mining town was not easy. Money and friends didn't seem like something people talked about, at least not the adults. There was always something that needed to be done. Money for this Colegrove Family didn't grow on trees. Every penny had to be earned and spent well. I have heard some of Ruby & Curt's children say, "mama would do the wash and ironing for flour and grease." The Court Cafe', Jiffy Grill and Town Side Restaurant was some of the places Ruby worked. These were times when a burger only cost a few cents, maybe a nickel. Curt, however, worked in the mines. As did almost every other man. Curtis was not fortunate enough to be home every evening with his family. Curt would go to work and sometimes be gone for days and maybe weeks at a time. Just workin' in the mines. At one point in this Colegrove Family, Johnny Roy (oldest son) moved to Michigan for work other than coal mining. Curt, Ruby and the kids (atleast the ones still living at home) also moved to Michigan for better work and better pay. Ruby did not like Michigan at all. She told Curt, "with or without you I am moving back to Kentucky. It's too cold". Curt decided to stay in Michigan and Ruby and their kids returned to Harlan County, Kentucky. Curt visisted and would sometimes send money. Some of the children remember taking a few trips (without Ruby, with other siblings) to Michigan to see their daddy. Howard and Ella May Colegrove (Curtis' parents) seem to have come from families of wealthier means. Per memory of some of Ruby & Curt's children, they remember Howard and Ella always living in the higher elevations of Harlan, mainly to stay free of any flooding. (Flooding back then was a real big issue for Harlanians) Some of their children also remember Ella May not liking Ruby's kids. (They remember Ella referring to Curtis not to bring those kids into her house.) Curtis' youngest sister Mary remembers her mother as quiet and nice. Why do the two sides of these families have different memories of the same person? Curtis (when home and not working in mines, before he moved to Michigan) would visit his mother and father daily and enjoy breakfast. You think, eleven kids? How could they al live together? Some of the older siblins had moved out and started their own families. Ruby & Curt's ninth child, Tina remembers moving to Texas for a while to live with the oldest sibling, Belva. She remembers living there for about five years then coming back to Kentucky. At another time, Ruby & Curt's fourth child Pat (who had five children) and Cindy (eight child) went to Michigan to see their dad. Because Ruby and Curtis didn't have much money, they always had to rent their homes. Sometime after Curt moved to Michigan, Becky (Rebecca Faye, tenth child) was hit by a car. Ruby received money for everything they had to go through (doctors, etc) and she bought a house. I am not sure what happened to the house. Practically every time a flood hit Harlan, Ruby and the kids had to move. The terms of enlistment: Enlistment for the duration of the War or other emergency, plus six months, subject to the discretion of the President or otherwise according to law. National Archives and Records Administration. U.S. World War II Army Enlistment Records, 1938-1946 [database on-line]. Provo, UT, USA: The Generations Network, Inc., 2005. Original data: Electronic Army Serial Number Merged File, 1938-1946 [Archival Database]; World War II Army Enlistment Records; Records of the National Archives and Records Administration, Record Group 64; National Archives at College Park, College Park, MD. This is a pair of glasses that Curtis C. Colegrove wore.